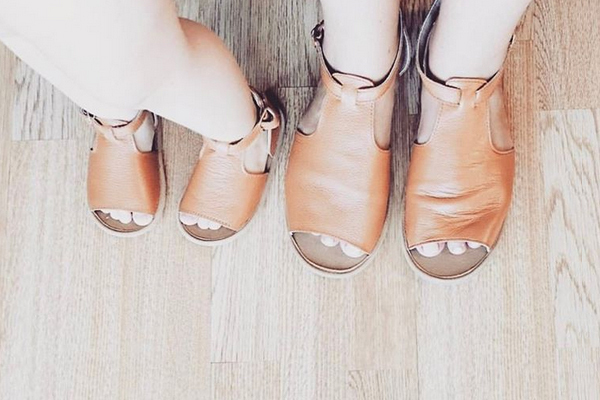 Twin with your tot in Fawn and Finch sandals! Littlies always get the best choice of swoon-worthy shoes, but twinning footwear with your toddler? Yes you can! Autumn might well be here, but we’re not ready to step out in full socks and boots just yet. A leather sandal with fantastic foot coverage, Mummy Eldorado sandals match brilliantly with the adorable, child sized Eldorado sandals from Fawn and Finch. We’re utterly spoiled for choice when it comes to choosing a colour to show off our pedi in – the neutrals are covered and it’s a delight to spot silver, the new blinged up wardrobe neutral. My heart however lies with the awesome Leopard Mo-Hair Eldorado‘s ($49.95). If they don’t put a pep in your step, I don’t know what will! Eldorado sandals to fit children aged up to four-years-old, are priced from $33.95 and adult sizes 5 to 10, are priced an amazing $49.95. Available for pre-order at Fawn and Finch, they’re expected to ship mid-May, so be quick!